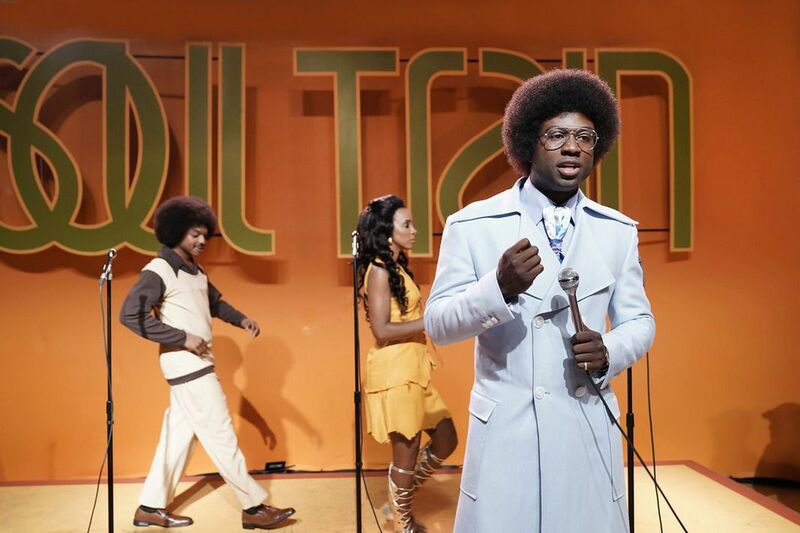 Sinqua Walls stars as "Soul Train" founder and host Don Cornelius in BET's new drama "American Soul." Puppy Bowl XV. Five of the dogs whose teams are competing for this year’s “Lombarky” trophy are from three Philadelphia-area shelters. And if puppies aren’t enough, there’s also the promise of baby sloths, baby porcupines, and baby kangaroos. 3 p.m. Sunday, Feb. 3, Animal Planet. Dr. Pimple Popper: The Poppy Bowl. Move over, puppies and kangaroos. There’s a new Super Bowl counterprogramming strategy and it’s — zits. A six-episode marathon of the reality show featuring dermatologist Sandra Lee — also known as "Dr. Pimple Popper — will, according to TLC, include “behind-the-scenes stories, POP-up Factoids, and Where Are They Now updates of some of Dr. Lee’s most memorable patients and cases so far.” 5 p.m. Sunday, Feb. 3, TLC. American Soul. New 10-episode drama about the making of Soul Train premieres in back-to-back episodes, with Sinqua Walls as the late Don Cornelius, who created the dance and music show and hosted it from 1971 to 1993. Series guest stars include Kelly Rowland as Gladys Knight, Michelle Williams as Diana Ross, Bobby Brown as Rufus Thomas, and Gabrielle Dennis as Tina Turner. Cocreator Jonathan Prince was also the producer behind the Bandstand-themed, Philly-set series American Dreams. 9 p.m. Tuesday, Feb. 5, BET. Movers & Makers. New WHYY-produced series highlights people and programs in the Greater Philadelphia arts and food scene. Hosted by South Philly’s Andrew Erace of Green Aisle Grocery and the Food Network’s Great American Food Finds, its premiere includes looks at BalletX and at the music camp Girls Rock Philly, and interviews with jazz singer Joanna Pascale and restaurateur Aimee Olexy of Talula’s Table and the Love. 9 p.m. Thursday, Feb. 7, WHYY12. White Dragon. Eight-episode British thriller stars John Simm (Doctor Who) as college professor Jonah Mulray, who, after his wife, Meghan (Dervla Kirwan, Ballykissangel), is killed in a suspicious crash in Hong Kong, travels there to claim her body. There he learns that she, and their marriage, might not have been what he’d thought. Anthony Chau-Sang Wong stars as David Chen, a former police officer who also had reason to think he knew Megan. Friday, Feb. 8, Amazon. PEN15. Would you want to relive seventh grade? Adult actresses Maya Erskine and Anna Konkle play remarkably convincing versions of 13-year-old best friends in this middle-school comedy set in 2000. Cocreated by the two leads with Sam Zvibleman, its school is otherwise populated by more age-appropriate actors, but the language and subject matter suggest it’s meant for people at least old enough to be happy they’ll never have to go through this again. Friday, Feb. 8, Hulu. One Day at a Time. One of TV’s best comedies, streaming or otherwise, returns for its third season, with Gloria Estefan guest-starring in the first episode as the long-estranged sister of Rita Moreno’s Lydia. Friday, Feb. 8, Netflix. Riviera. Julia Stiles plays an art curator whose billionaire husband (Anthony LaPaglia) dies in a yacht explosion, leaving her to deal with his grown children, his ex (Lena Olin), and a tangle of legal problems she never saw coming. (If you can’t wait to see what happens next, the 10-episode first season series is already available for streaming to Sundance Now subscribers.) 10 p.m. Saturday, Feb. 9, Ovation.